Four billion years ago, Mars may have looked drastically different than it does now. If you didn't know any better, you'd think it looked a lot like Earth, with beautiful skies, abundant bodies of water and a potentially thriving environment. At least, that's what a terrific new simulation by NASA suggests. 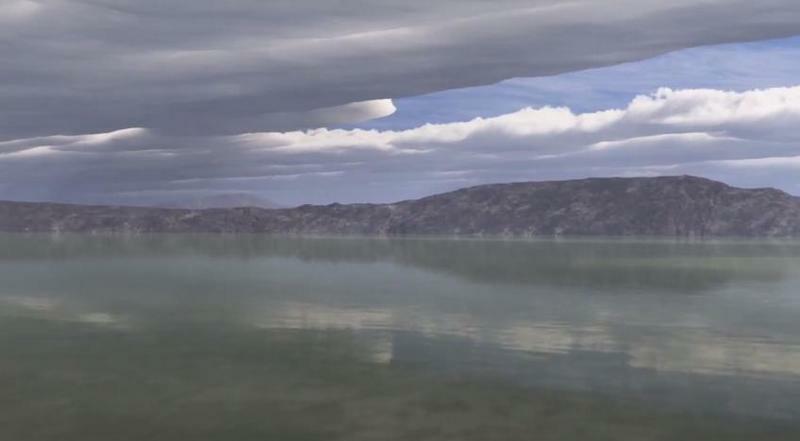 We've seen plenty of evidence that Mars once contained water, and this video imagines what the surface may have looked like. It's sure a far cry from the barren red landscape we're familiar with today. As NASA explains, when Mars was younger, the planet appeared to have had an atmosphere conducive to oceans of liquid water. And, maybe, life. "This animation shows how the surface of Mars might have appeared during this ancient clement period, beginning with a flyover of a Martian lake," NASA said. "The artist's concept is based on evidence that Mars was once very different. Rapidly moving clouds suggest the passage of time, and the shift from a warm and wet to a cold and dry climate is shown as the animation progresses." Over the past year alone, NASA's Curiosity rover has repeatedly found evidence of Mars once containing water while diligently combing the Martian surface. In September, Curiosity actually analyzed the Red Planet's soil and wound up finding water molecules, though they're not freely accessible to humans. If NASA's animation is anything close to what Mars previously looked like, the question arises as to how the planet's atmosphere changed, and whether or not humanity will one day be able to colonize the barren red rock. Hopefully the same fate doesn't befall Earth.